Cheonjeyeon Waterfall is located on the west of Jungmun Village and the east of Saekdal-ri. This three-tiered waterfall is made up of three distinct parts that cascade from the ceiling of a cave. As the main waterfall drops down, it creates two smaller waterfalls, which makes Cheonjeyeon so unique and spectacular, and together they flow into the sea. The first waterfall, which is made up of cold spring water, makes a 22-meter drop into a pond that is 21 meters deep, and then takes another 30-meter drop to create the two smaller waterfalls. Cheonjeyeon Waterfall is a very popular attraction in Jeju-do, but swimming in it is prohibited. In ancient times, however, locals are said to have bathed here often. They believed that the waterfall had healing powers if one stood under it on the 15th day of the seventh lunar month. Adding to the allure of the site are the rare solipnan reed plants or skeleton fork ferns that grow in the crevices of rocks, the surrounding temperate forest that was designated as Natural Monument No. 378, Cheonjeru Tower, the nearby Cheonjeyeon Valley, and Seonimgyo Bridge that connects Cheonjeyeon to the Jungmun Tourist Complex. In May, the Chilseonyeo Festival s celebrated at Cheonjeru Tower, while the Seven Fairies Festival is held every two years in Cheonjeyeon Valley. Seonimgyo Bridge itself is quite a stunning site. It is an arch-shaped steel bridge and on it one gets a great view of the waterfall, Cheonjeyeon Valley and the lush forest below. The bridge’s steel columns are designed with 14 sculptures of fairies, seven on each side. The Cheonjeru Tower, on the other hand, is also adorned with several images of a turtle, pig, dragon, duck, and carp. To get to the waterfall, tourists may take Airport Limousine Bus No. 600 that travels from Jeju Airport to Yeomiji Botanical Garden. Cheonjeyeon Waterfall is only about five to ten minutes by foot from the Botanical Garden bus stop. Traveling by private car or taxi from the airport takes only 30-40 minutes. In the months of March through October (summer), Cheonjeyeon is open from 8:00 a.m. to 7:00 p.m. and from November to February (winter) from 8:00 a.m. to 6:00 p.m. only. Admission for adults is 2,500 won and 1,370 won for teenagers and children. Tickets may be purchased at the botanical garden. Senior citizens are welcome for free. 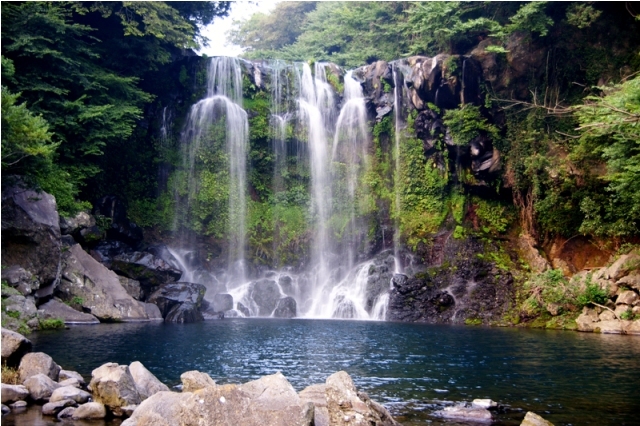 Cheonjeyeon Waterfall is not to be confused with another stunning Jeju-do waterfall, Cheonjiyeon Waterfall. The island of Jeju-do off the southern coast of South Korea is known for many natural attractions including three amazing waterfalls, Cheonjeyeon, Cheonjiyeon and Jeongbang.